UK scientists will lead an international expedition to the huge new iceberg that recently calved in the Antarctic. A-68, which covers an area of almost 6,000 sq km, broke away in July. 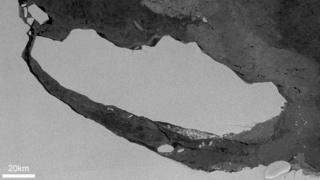 Researchers are keen to investigate the seafloor uncovered by the trillion-tonne block of ice. Previous such ventures have discovered new species. The British Antarctic Survey has won funding to visit the berg and its calving zone in February next year. It will use the Royal Research Ship James Clark Ross. BAS cautions, however, that the final green-light will depend on the berg’s position at the time and the state of sea-ice in the area. A-68 will need to be well clear of the Larsen Ice Shelf from which it calved, and any marine floes on top of the water will have to be sufficiently thin to allow the JCR access. “It’s fantastic news to have won approval,” BAS marine biologist Dr Katrin Linse, who will lead the cruise, told BBC News. The drifting berg, one of the biggest ever recorded in the Antarctic, is exposing seafloor that probably has not been free of ice cover for 120,000 years – during the peak of the last warm phase in Earth’s history known as the Eemian. The area has already gained protected status from the Commission for the Conservation of Antarctic Marine Living Resources (CCAMLR). This gives scientists priority access and keeps commercial fishing at bay for a minimum of two years, but in all likelihood 10 years. Past experience, though, tells the scientists they should encounter animals similar to those seen in the Antarctic deep sea – organisms that also live far away from sunlight many hundreds, even thousands, of metres down. These include particular types of sea cucumber, starfish, bivalves and sponges, some of which have become carnivores in the absence of a phytoplankton food supply. The research cruise will take samples through the water column and from the bottom sediments. The intention is to establish a baseline from which to assess future change, as organisms that would not normally live under ice start to move in. These “pioneers”, such as large glass sponges, are expected to have begun their colonisation by the time the German research ship Polarstern visits the area in February/March 2019. This cruise is led from the Alfred Wegener Institute in Bremerhaven but its members will also be on the JCR and vice versa. At present, satellite images are used to monitor the berg’s position, but with the region now emerging from the austral winter it is only a matter of time before an aircraft is sent to film the ice block. BAS intends to do this in early 2018. “We’ll pass the berg in the JCR, certainly, but we can’t take samples off it because you never know how stable the sides are going to be,” Dr Linse added. A-68 has been calculated to have an average thickness of about 190m, but there are places where the draft is around 210m. This means there will be some ice walls standing above the water line that may be roughly 30m high. ← Fostering children: Job or vocation?